Waiting for something in our lives is perhaps one of the most universally understood occurrences. Everyday, we wait in some way or another for something – a phone call, an email, for our loved ones to arrive, for the rain to stop. The world does not revolve around any individual’s needs or schedule. We must all adjust our lives to its system – naturally occurring or man-made – and most often that means, waiting. Waiting by itself can be little more than inconvenience but mix in politics of a region or city and desires for societal change and one can read a powerful metaphor in something as seemingly innocuous as waiting for a city bus. 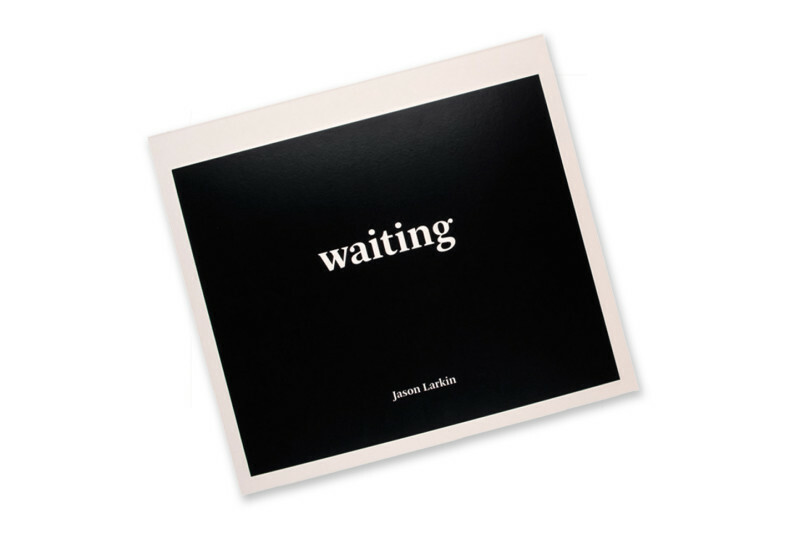 Jason Larkin’s new book Waiting from Fourthwall Books and Photoworks does just that. 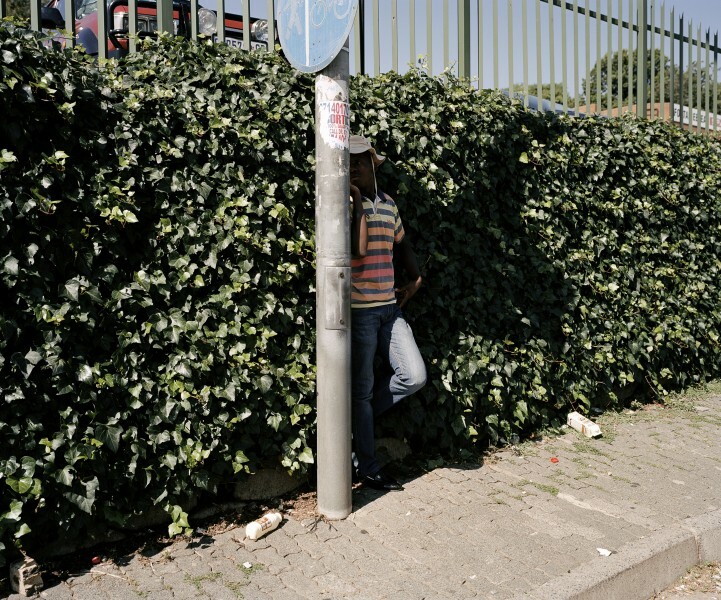 Larkin, a British photographer who lived in South Africa, photographed people as they waited alone at bus stops around Johannesburg, specifically drawn to those who sought to shade themselves from the unrelenting sunlight. We are not privy to who the people are, where they are going, nor why. The only information given is the duration of each wait, which acts as the caption to each photograph – 20 minutes, 2 minutes, 6 hours and 45 minutes, 15 minutes – the longest, 9 hours. 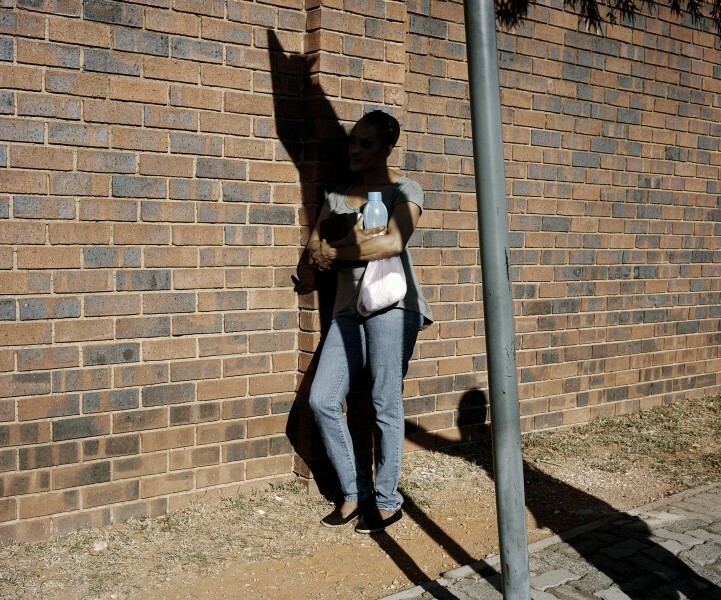 With the figures cast in heavy shadow, the natural desire in us as viewers to identify with the subject through it’s face, forces us to look deeper into that shadow on dark skin to resolve the individual; often leaving only their body language, and clothing to provide important clues to personality or social status. One man’s clothing suggests the profession of day labourer, while another’s pressed white collar and backpack suggests a student. 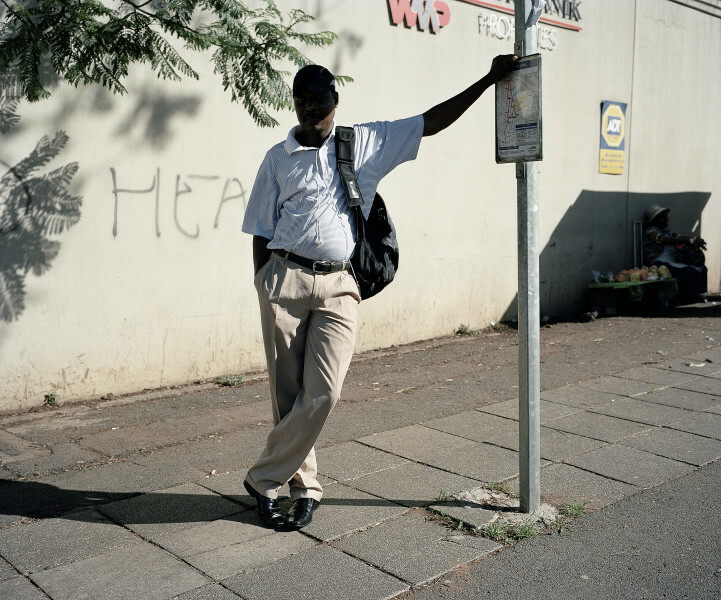 Within just eighteen plates, Waiting opens a wealth of possible readings into contemporary life in South Africa, while also behaving as a small continuation of David Goldblatt’s work The Transported of KwaNdebele. Those finer details, clues and meanings emerge only when we, as viewers, employ similarly that which each subject was asked to while waiting – patience.